Soon I’ll sail down from Antigua to Bequia for the Easter Regatta. I’ll be hosting Vanishing Sail Film Screening at the Bequia Easter Regatta with SPECIAL Announcement! Winner of 7 international awards – On the tiny island of Carriacou in the West Indies, the last wooden sailboat builder dreams of saving a great tradition passed down the generations from Scottish settlers that sailed there centuries ago. The film follows Alywn Enoe’s journey of determination and resilience over three years, from hauling trees with his sons, to a final traditional launching ceremony. Stories of the old Caribbean – trading by sail and smuggling contraband interweave a tribute to the independent spirit of a small island community. “An outstandingly beautiful and timeless film that deserves the widest possible audience.” Julian Parker, OBE, Maritime Foundation. I sailed across the Atlantic Ocean 3 times now. I learned a lot on how and how not to do things! I especially saw and learned about the importance and decline of the ocean! Here’s what I learned in the waste department. Surely the intentions of the sailors and yachtsmen are to take best care of the environment. We all love the ocean. And we like to keep it healthy so we can keep exploring this beauty forever! We also love visiting the islands and waste management facilities may be non-existent. 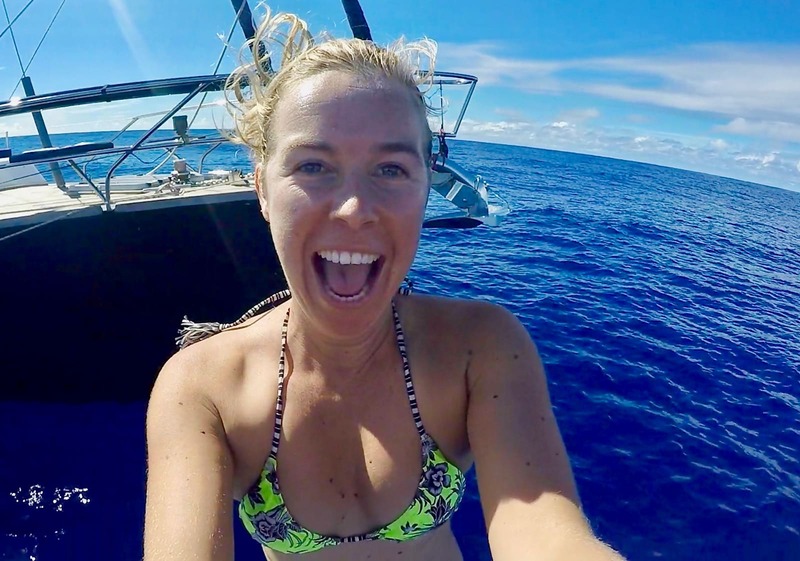 How to deal with waste when sailing across the ocean? In Part 1. On Shore, I discussed ideas to minimize your footprint as a sailor while still on shore. With conscious provisioning you already reduced your negative impact bigtime. Now you’re out there. What to do with the waste that you are creating? Here’s Part 2, for once you’re sailing out there. What can you throw overboard? Organics (food). This can go overboard 12 miles out of the coast. Make sure you do this well ahead before arrival to the Caribbean. Food can bring unwanted bacteria and insects to an island and change the whole ecosystem. Fruit peels can float around for years since it doesn’t get biodegraded at sea on how it does on land. Nothing else but coconut shells goes overboard. The ocean is not a dumping ground. Things might sink and go deep. It won’t be gone. So no glass, no cans, no cardboard, no cigarettes and no paper should go overboard. And definitely no plastic. Never throw anything overboard that doesn’t decompose quickly in water. Can you throw glass overboard in open sea? NO. It sinks, but never ever disappears. Yes, it’s made of sand but glass as for what we have created it would never appear in nature like it. We add things for functionality and colour. 50% – 80% of glass is recycled. This is great because it saves a lot of resources and raw materials to make glass from scratch. Leave your glass for recycling. Can you throw cans overboard in open sea? NO. it sinks, but cans often have a plastic coating. Also, this is a welcome material to be recycled. It does not take many resources to process aluminium into new cans, containers, or maybe even a boat! It does take a lot of resources to extract new raw materials from the earth. Plastic? No. no. NO! Never ever disappears. Cigarettes? No! Loaded with chemicals. Chewing gum? No Chewing gum is plastic. Cardboard and paper towels? If it’s untreated paper, then it’s ok to throw overboard. If it’s white or has any sort of ink on it, it’s not ok! Almost all paper and cardboard is treated (with ink, UV coating, foils, glues, polymers). White paper towels are treated with chlorine which is a dangerous toxic for your own and the ocean’s health. It should not go overboard. Cardboard usually has ink on it, which is a kind of plastic. This includes the label of a teabag, which is full of ink. Tea bags? No. They have plastic in it. Can you throw cans over board when sailng? Nope! Many pilots, guide books, articles and sailor forums say that tins and glass jars can go overboard in deep seas. After all, they sink and are made from natural materials, right? Accordingly, many sailors do this. However, these articles are usually written from a practical perspective, not from an environmental one. Re-using and recycling can be very practical on board too! Bottles and tins have been found in the deepest trenches ocean trenches with the brand names and logos still readable. Considering the critical state the ocean is in, every item that does not come from the sea should not be tossed in. Glass and tins are much more valuable on land than at the bottom of the sea. Recycling uses fewer resources than extracting new materials from the ground. These materials simply do not belong in the ocean. The ocean is not a dumping ground. If you wouldn’t eat it or put it on your skin, why should the living organisms in the sea have to deal with it? Your waste might sink into the deep, but it won’t be gone. No glass, no cans, no cardboard, no cigarettes and no paper should go overboard. And definitely no plastic! Never throw anything overboard that doesn’t decompose quickly in water. Even fruit peels can take years to biodegrade at sea. They are valuable to land as compost. Do the best you can to close the loop and contribute to the circular economy. So how to process the waste on board when sailing? If you do well the waste bucket is the last that gets full! Rinse waste with saltwater to avoid smells and the introduction of invasive species when disposing of in a new destination. Especially meat, cheese and dairy packaging should be rinsed well. Once full get it out of the galley and into a storage container. It helps to separate plastic, tins, cardboard, and glass right away into different bags. Unfortunately, cans, bottles, and jars are not being reused but at least recycled. 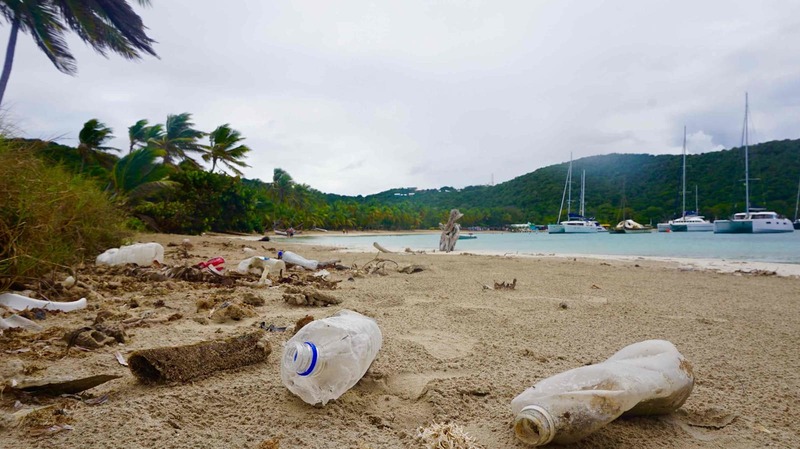 So far cans and bottles are preferred crushed (Greening the Caribbean). Make an ashtray (you can simply tape a bottle to the boat). Cigarette buts can be tossed in there. Reuse tin cans and glass containers where you can. If you plan to go to remote islands, don’t crush them and you can make someone happy with it. In the Caribbean, it’s preferred to be delivered crushed. Cut non recycle plastic (film, bags and thin wrappers) into small pieces to reduce the volume. But in general, if you have place to get it on board, you have place to store it until you can dispose of it properly. Have all organics dumped overboard 12 miles before arriving at the island. You don’t want to bring anything invasive into an island. Read more about Contributing to a Healthier Ocean in Ocean Nomad, the adventure travel guide to the ocean, for the ocean. What are your ideas on processing waste on board on a sailing vessel? Fishing can be an exciting part of a long sailing passage, like the Atlantic crossing – but catching is a different story! On my three Atlantic crossings (combined), we caught a total of three fish that made it up to the dinner plate. In the process, we lost about ten lures and eight fishing lines that are all still floating around, ‘ghost fishing’ somewhere in the ocean. Only Neptune knows if a dolphin or sea turtle may have gotten injured, entangled or killed by it. Or maybe the lines got stuck in a boat propeller. 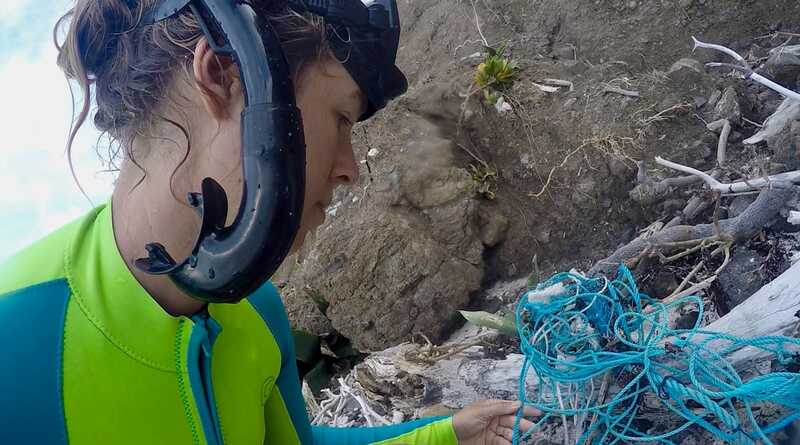 Every bit of fishing gear lost will continue to damage in the ocean. It will never disappear. Many sailors like to fish. It’s a better way to source your fish than buying them in cans, where we often don’t know how and when it’s been caught and mixed. But, do you really need to catch fish? Here’s a few things to consider. Do you really need to catch fish? The saying goes: “there’s plenty more fish in the sea.” Well, this saying is outdated! There’s actually not much left. Not so long ago, we thought that the ocean could replenish whatever we take from it. After all, the oceans are huge! Now we know that that is not the case. For fishing to be sustainable, we need to allow enough time for new ones to be born so the population can be maintained. The reverse is happening. We have taken more than the ocean ‘produces’, and we’re taking fish faster than they can reproduce. It’s called overfishing. Overfishing has wiped out 90% of the ocean’s large top-predators, like sharks, tunas, cod, and groupers. And we need the big fish in the ocean because they eat the weaker ones. They prevent the ‘jenga’ from collapsing. The big fish that are still out there weigh 50% or less than they did 50 years ago. The average weight of a swordfish caught today is 45 Kilos. In the 60’s this was 130 kilos (1). Of all fish species, 52% is fully exploited, 17% is overexploited, and 7% is depleted. Common seafood choices such as tuna, shrimp, and salmon are among the worst affected (2). I don’t want to withhold the good news from you: a whopping 1% of species are recovering from depletion! Besides impact plastic has on our ocean, wildlife and environment, plastic is a concern to human health. Plastic isn’t just around us, it’s in us! Through food we eat, water we drink, products we use, things we touch, and the air we breathe. Plastic is found in a third of UK-caught fish, including cod, haddock, mackerel and shellfish (3). Shellfish lovers could be eating up to 11,000 plastic fragments in their seafood each year (4). It’s not a question anymore if we are eating plastic from seafood, the question is what it does to the health of animals, the ocean, and us. Plastic in the ocean contains high levels of pollutants such as PCB, Phthalates, organic pesticides like BPA, and heavy metals like mercury, arsenic, and lead. These are proven poisons linked to all sorts of diseases, including cancer, hormone disruption, and infertility issues (5). The problem is not just the fish we’re taking; the problem is also how we’re taking it. So if you must catch fish, here are a few suggestions to bear in mind to make it a little less harmful. Fish with the right gear or not at all! Choose the right hook and line thickness. Ocean fish are big guys. A thin line will not hold and will end up at sea as a ghost fishing. Do your research to find out if your catch is a threatened species or not – then either release or eat. Only catch and kill what you can eat. Catch something you can’t eat? Throw it back within seconds, not minutes. Is it too big to eat? Throw it back! Kill the fish right away once you caught it. A handy trick is to spray alcohol in the gills. If you don’t, the fish will suffer tremendously, and all that stress will affect the quality of the flesh. It’s not healthy for the fish, or for you! Check the local situation and rules for species, size, and sustainability. Spearfishing is prohibited almost everywhere in the Caribbean (except for often lionfish, which are an invasive species and need to be reduced for the ecosystem to be in balance). Be aware that many fish in the Caribbean are poisonous. Wherever you are, take it easy on the bigger guys. We need them in the ocean! They eat the weak and sick ones to keep the system in balance. Few are left because it takes so long for them to mature. The higher up in the food chain, the older the animal, the more contaminants have been built up. Tuna, swordfish, shark, cod or sea bass all have dangerous levels of mercury and PCB accumulated in their bodies. By eating some species, you can even help the ecosystem, such as lionfish in the Caribbean. While they were a rare sight just ten years ago, the population is now out of control. We have a lot of food to choose from these days with healthier alternatives that still provide the same benefit without killing life. An exciting option I have found is consuming sea algae like kelp, nori, spirulina, dulse, and Sargassum. Hundreds of edible sorts of sea vegetables are known. Seaweeds are real super foods that mostly need sun and current to thrive. These vegetables of the sea are where fish get their omegas from in the first place. It’s a healthier food choice for you and the ocean. And they just float by your boat! Learn more about the state of the ocean and what we can do to contribute to a healthier ocean in Ocean Nomad. Make a natural straw, make a bracelet from ocean trash, paint a sign from driftwood, write a poem, bake a cake, make a video, draw something, give a message in a bottle. Take your cousin out sailing, sing a song, perform a dance, give a surf, yoga or freedive lesson. Teach the little one how to swim, help someone with their website, design a logo. Give an Online course, E-Book, or service that can help someone thrive. Thank you for supporting the ocean conservation actions by buying book Ocean Nomad. My Gift to YOU. A big THANK YOU! For sharing, caring and support to keep me going on the mission to connect more people to the ocean. For more gift ideas and ways to minimize impact as an eco-minded adventure traveller check my mega guide on What’s in my eco travelkit.